Other experience: Wing chun Kung Fu, Boxing, Kick Boxing, Judo and Karate. 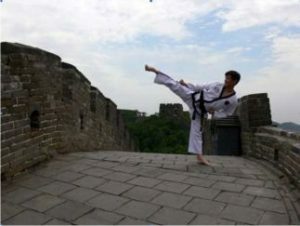 He started his martial arts journey while growing up in Hong Kong. It was not until 1983 that he started Taekwondo. Master Slater is the complete Taekwondo instructor. Master Slater has appeared in numerous magazine articles and wrote the forward for world famous set of books ‘The Encyclopedia of Taekwon-do Patterns’ by Stuart Anslow and appears in Volume 3 demonstrating some of the most senior Taekwondo patterns for students to learn and practice from.